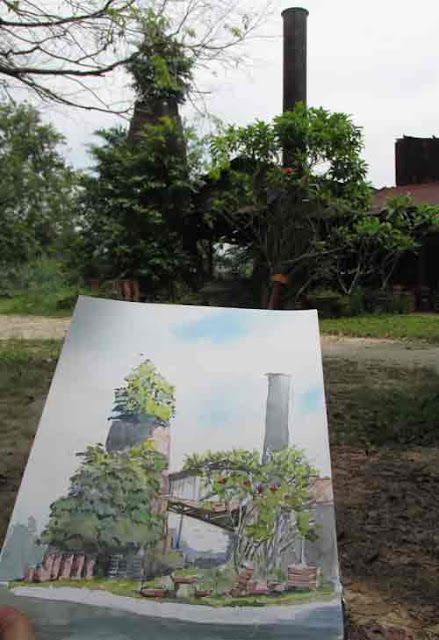 MY ARTIST friend Phang Chew who lives in Ipoh took me to this old pottery kiln in Jalan Kuala Kangsar to paint the scenery there. Ah Fatt, the partner-owner of the Xin Fa Pottery, is his friend. I decided to grab the opportunity to visit the place because I had never been to a pottery before. 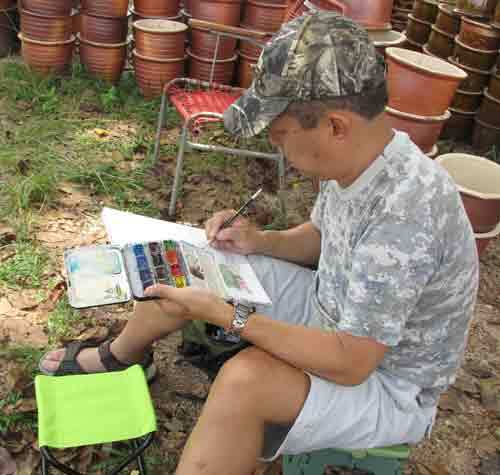 Phang, who is an accomplished outdoor painter well-known in Ipoh, has sold many pieces of the scenery he painted here. My sketch of the old kiln's smokestack. 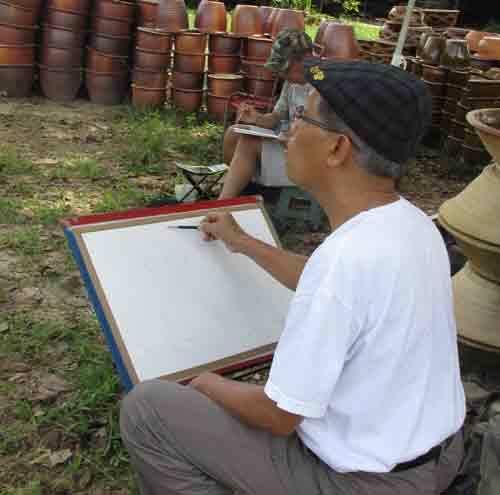 Located along Batu 2-1/2 Jalan Kuala Kangsar, just 100 metres off the main road, Xin Fa Pottery is over 60 years old and has several kilns of various sizes producing many types of clay pots. According to Ah Fatt, there were quite a number of such factories two or three decades ago in the area. Dwindling business and development have caused many to move out. His factory now produces pots for the local market (including artistic clay sculptures) as well as for export. A Schmincke Field Box in one hand and the leg becomes my easel. Although the owner was a little busy to take me through the entire process of pot making, he did allow us to go into the main wood-fired dragon kiln which had yet to resume operation. The dragon kiln is a Chinese invention that dates back thousands of years. We had to be careful as the kiln’s ceiling is not very high and the years of firing have caused the glass-sharp stalagtite-like protrusions to form. We were told to lower our heads or risk getting a nasty cut. Sifu Phang Chew in his element.